Being able to speak naturally is important for ESL learners, and this page gives examples of ESL Christmas conversations. These conversation show the types of conversations that native speakers would have with each other and the way they would speak. The first part of this page has two example conversations for you to look at and understand. You should read them and see how the conversation progresses and the type of language used. You can also watch the conversation as they have been made into two short cartoons that have other clues to help you understand the words being used. If you need further help you can look at the ESL Christmas vocabulary page to see the meanings of many Christmas words. Topics so you can have a conversation. Situation: Jane and Lucy talks about shopping for Christmas gifts. Jane: Hi, Lucy! Are you free tomorrow? I need your company to buy a Christmas gift for my sister. Lucy: I’m not sure if I’m free tomorrow. I’ll be helping my mom preparing the turkey. What time do you plan to go shopping? Jane: Around 10am. Can you go? Lucy: Yes, I think I can. What do you want to buy for your sister? Jane: I want to buy her a handbag. Jane: No! I can’t afford a designer bag. Just a branded bag. Lucy: There’s a sale at Marks & Spencer. What if we go there? Jane: Sounds like a good idea. Are you going to buy something, too? Lucy: No. I just went there a week ago. I bought a beautiful purse for my mom. Jane: Did you get a discount? Jane: Wow! Can’t wait to go there! Anyway, I remember you said something about buying your nephew a toy car. Have you bought it? Lucy: Yes, I have. I bought it online at Toys R Us. Jane: Was it cheaper to buy it online? Lucy: Well, it is easier to compare the prices. There are many shopping apps and websites that offer price comparison. Situation: Patrick and Tui talks about attending a candle light service on Christmas Eve. Patrick: Hi, Tui! I’m going to attend a candle light service at the local church. Do you want to come? Tui: Who else is going? Patrick: Just Lucy, Andrew and Bob. Tui: What about Jane? Isn’t she coming? Patrick: Jane and a couple of other college friends are responsible for holding the service. She’s already at the church preparing for everything. Tui: I see. Is she going to sing, too? Patrick: Yeah. I heard she’ll give a solo performance. Tui: That’s great. I like her voice. She’s really talented. What about the carols? What songs will be sung? Patrick: I don’t know. May be ‘Joy to the World’ or ‘Silent Night’. Tui: When are you going, by the way? Patrick: The service will start at 7pm. Can I pick you up at 6pm? Tui: Sure, that’s nice of you. Um, I never attend a carol service before. What should I wear? Patrick: Just dress smart casual. Tui: Do I need to bring a candle? Patrick: No, you don’t need to bring your own candle. Candles are handed out as we arrive. The following part of the page has the three ESL Christmas conversations for you to do. By doing them you will practice forming conversations so you will be able to speak better when you really need to. In this first ESL Christmas conversation exercise you need to read the following conversation and decide which option (A-D) in each question has the correct text to fill in the gaps. Once you have finished you can use the get score button to see the correct answers. Situation: Bob and Andrew talk about family gatherings on Christmas. Bob: What’s your plan for the Christmas holidays? Andrew: I’m going to __________(1)__________. What about you? Bob: I am, too. I missed it last year because I traveled to Italy. Andrew: I’ve always wanted to take a trip during the Christmas holidays and __________(2)__________ somewhere else with different atmosphere. Bob: What’s holding you back? Andrew: My parents always ask me to go home during Christmas. They always say that Christmas is the time __________(3)__________ with family. If I want to travel, I should do it in the summer. Bob: Why not ask your parents to go with you? Who knows if they’re interested. Andrew: Hey, that’s a good idea! But there’s one thing that I’ll miss if I spend Christmas abroad. Andrew: I enjoy __________(4)__________ with my extended family, especially with my nieces and nephews. Christmas is not perfect without that ritual. Bob: What is __________(5)__________ you have ever gotten? Andrew: Last year, I got a smart watch from my dad. It’s a very cool gadget and so far, that’s the best present. Choose the best option (A-D) in the following five questions to fill in the blanks in the Christmas conversation given above. For this ESL Christmas conversation activity you need to write a conversation of your own. You should use the example conversations above to guide you as they can be templates for what you should write. The topic of the conversation should be about Christmas. You can use the words on the vocabulary page as a guide to help you think of a topic. When you have finished writing your conversation you should find some friends and perform the conversation so you can get practice of speaking. 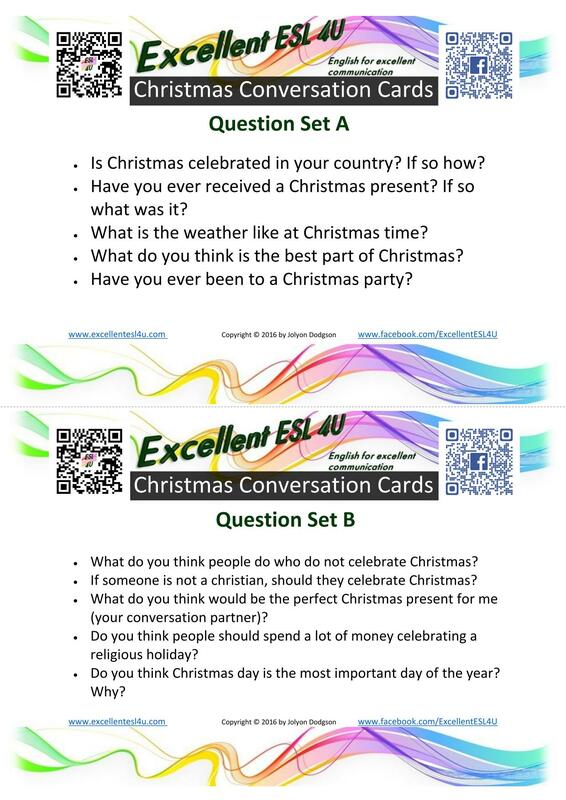 The final ESL Christmas conversation exercise has two sets of conversation topics for you to use with your friends. One person should take question set A and the other person has question set B. Then take it in turns to ask each other the questions. Say as much as possible when you reply to the questions, and also ask follow up questions if you can think of them. At the end you can swap the question sets and start again. Is Christmas celebrated in your country? If so how? Have you ever received a Christmas present? If so what was it? What is the weather like at Christmas time? Have you ever been to a Christmas party? What do you think people do who do not celebrate Christmas? If someone is not a christian, should they celebrate Christmas? What do you think would be the perfect Christmas present for me (your conversation partner)? Do you think people should spend a lot of money celebrating a religious holiday? Do you think Christmas day is the most important day of the year? Why?